Science Foo Camp 2009: Scifoo Day Two | O'Really? Larry Page ran a session on Making Artificial Intelligence happen. In brief, Larry argued that not enough people are working on this problem. Marvin Minsky joined in talked about his book The Emotion Machine. I’d write more about this, but Larry asked for what he said to be off-the-record so he could speak more freely. Following on from this Harry Collins and Lee Smolin ran a session titled: The Social Nature of Knowledge, Science and Artificial Intelligence. As David Colquhoun pointed out in the session, you “need to be something of a sado-masochist” to attend a session on the sociology of Science but there was some interesting discussion on the Science (truth?) vs. Belief (religion) debate. Henry Thomspson pointed out: some argue that “Knowledge is true belief” which can make it hard to distinguish between Science and Religion. Jamie Heywood described his simple “truth formula” where truth = cost to make a claim divided by the cost to disprove claim. Next up Douglas Kell did a session on Data-driven Science. This discussed the relationship and balance between hypothesis driven science (hypothetico-deductive) and data driven science (via inductive reasoning and machine learning for example) . Attendees in this session included Tony Tyson (Director of the Large Synoptic Survey Telescope), Craig Rowell (BioRad), George Poste, Julia Lane (NSF), James Wilsdon (Royal Society), David Colquhoun, Nat Torkington, the six-minute-genome guy from Halcyon Molecular whose name I can’t remember and Annalee Newitz. Much of the discussion was about the over-reliance on hypothesis driven science (e.g. 92% of NIH R01 grants have to be hypothesis-driven) which can make the “fishing-trip” or “data-driven” science difficult to do. One conclusion from this presentation was that both types of science are required and complementary. Then it’s time for lunch, not just any old food, but some yummy Google Food. In the afternoon, I ran a session on The Invisible Scientist: Personal Digital Identity on the Web, Problems and Solutions. After a short set of introductory slides we discussed some solutions to identifying scientists digital contributions, not just electronic journal publications but wiki edits, blog posts, software development, ontology and database curation etc. Participants in this session included Cameron Neylon, Julie Lant (NSF) who will reuse some of my data in a report she is writing (Yay! ), Nicola McCarthy (Senior editor of Nature Reviews Cancer), Shirley Wu, Michael Rogan, Mackenzie Cowell and Chris Holmes. The last time I was at Science Foo Camp (back in 2007) I felt slightly phased by the stellar company (nobel prize winners, billionaires, entrepreneurs, silicon valley A-listers, venture capitalists, artists, policy makers, movers and shakers) that I didn’t present anything. I’m very glad I made the effort this year, it forced me to think harder about the problem of digital identity (and solutions), which included a useful chat with Googler Ben Laurie (a cryptography person) who gave me the lowdown on OpenID, PKI and the like. Very useful stuff – thanks Ben and thanks to everyone who turned up at my session. The second session of the afternoon was on Google Wave with Cameron Neylon. I won’t say too much about this, because it will probably be blogged by Cameron and others – but it was an interesting peek into some of the current strengths and weakness of this software – especially from the point of view of scientists. The last two sessions of the day, I stayed in the Lightning Talks organised by Nat Torkington (see blog). These were great, probably my favourite part of scifoo this year. Each speaker got a very strict five minutes, including Natahan Wolfe, Ben Fry on visualisation, George Dyson on Darwin, Christopher Stumm on astronomical metadata, Adam Summers on fish, Linda Stone on unhealthy computing, Ed Lu, Brian Uzzi and Fiorenzo, Shelley Batts, Larry Weiss, Saul Griffith, Chris DiBona on telemedicine, Joshua Bloch on Java puzzlers, Christian Bok on poetry and Gregory Benford. 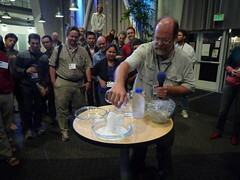 In the evening there were further demonstrations and talks, including sodium acetate crystals (ChEBI:32594) (with Theodore Gray – see picture above) and a talk by Bob Metcalfe (of Metcalfe law fame) on the “Enernet: Internet Lessons for Solving Energy”. One of the take home messages from this is that the energy industry should be much more decentralised (like the internet is). Bob argued that the huge centralised powerplants we have today are beginning to look as dated and obsolete as mainframe computers. So in summary, saturday at scifoo was a fantastic action-packed day, started early in the morning and went on late into the night. It’s almost impossible to capture it all in a blog post, so if you’re interested my scifoo 2009 photo set on flickr has more details. My mind has been blown into lots of little pieces again – thanks to all the organisers and participants for another great day. Sounds like SciFoo was an eclectic party of thinkers. Look forward to combing all these links. Thanks for the briefing, Duncan. Sounds like lots of fun! And thanks for the slides as well, I’m glad the session on identity was successful. I heard the session on data-driven science was great. Kent Kemmish from Halcyon Molecular astounded everyone with the company’s EM-based approach to whole genome sequencing. Complete personal genomes and methylomes in 6 minutes for <$100 soon a reality! Next-Gen ultra low cost sequencing will enable truly personalized, predictive, and preventive medicine.